As the sun set over the San Francisco Bay last Saturday evening, an undeniable buzz of anticipation ran through the Giants’ AT&T Park. A lifelong Beatles fan, I couldn’t help but feel a sense of giddiness at the realization that I was waiting to see one of my greatest musical heroes in concert. Surely there were many others who felt the same. And when Paul McCartney and his band took the stage after a nearly hour-long delay, the crowd exploded into a deafening roar that rivaled the screams of Beatlemania. 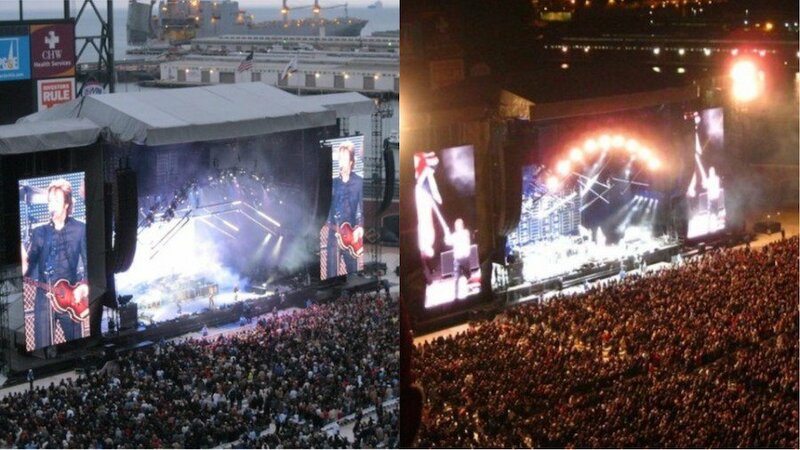 In fact, Saturday’s concert was the first time Paul McCartney had performed in the city of San Francisco since the Beatles’ last tour in 1966. The Fab Four’s performance at Candlestick Park would turn out to be the last public concert of their career, making Paul’s return all the more significant. The city welcomed him back with heartfelt enthusiasm and prepared itself for an unforgettable night. Emerging before us with his famous Hofner bass, McCartney leapt right into the show, which boasted a setlist diverse enough to please both the casual Beatle listener and the die-hard Macca fan. His 5-piece band effortlessly weaved through Beatles classics like “All My Loving” and “Back in the USSR”, a wide range of Wings tunes, and several songs from McCartney’s solo career (including covers of his experimental project, The Fireman). A few selections served as pleasant surprises, such as “Nineteen Hundred and Eighty-Five”, “Ob-La-Di, Ob-La-Da”, and a fitting “San Francisco Bay Blues”. All the while, his voice sounded just as youthful as it did four decades ago. In the second half of the show, McCartney paid tribute to his late wife Linda with the soulful ballad “My Love,” as well as former bandmates John Lennon (with the hauntingly intimate “Here Today”) and George Harrison (playing a beautiful rendition of “Something” on the ukulele). Subsequent highlights included 40,000 people singing together during “Give Peace a Chance” and a face-melting pyrotechnics display during “Live and Let Die.” A complete set list can be found here. Sir Paul was in great spirits throughout the entire night, cracking jokes about the weather and telling stories of the swinging 60’s. The crowd reveled in every minute. From my vantage point in the nosebleed seats, I could see that the audience was filled with the familiar glow of lighters and many unmistakable puffs of smoke during the evening. Even Paul couldn’t help but comment on the “sweet smell” in the air (met with a hearty cheer and more puffs of smoke). Pot or not, it seemed as though everyone was having the time of their lives, including the band. At 68 years old, McCartney proved that he is still as spry as ever; the show ran for three jam-packed hours, including a double encore that featured such heavy rockers as “Helter Skelter” and “The End.” I, for one, was thoroughly impressed. The thunderous standing ovation that followed indicated that the crowd was just as thrilled. What a great treat it must be for Paul to witness the span of generations that make up his audiences. Entire families of children, parents, and grandparents standing before him – all singing along to “Let It Be” – serve as a testament to his timeless music. The Up and Coming Tour will continue through August, making stops in the Midwest and Canada. As a performer, McCartney shows no signs of slowing down, which is a relief to any eager fans who have yet to see him in concert. After a night of pure entertainment and incredible music, I can say that the experience falls nothing short of magical.